Performers include: Seth Meyers, Ike Barinholtz, Emily Spivey, Taran Killam, Kenan Thompson, Bobby Lee, Paula Pell, Rashida Jones, Bill Hader, Josh Meyers, and Rachel Dratch. Created by Seth Meyers and Mike Shoemaker, this adult animated comedy follows a group of underdog superheroes as they try to live up to the expectations and reputation forged by their namesakes. Prock (Meyers) has always wanted to be a superhero like his father. Now that the original Mr. Awesome has retired, he has the opportunity to step into his shoes. With the help of childhood best friend Harry ‘Muscleman’ Strong (Ike Barinholtz) and team secretary ‘Concierge ‘(Emily Spivey), Prock goes about setting up a new generation of all American heroes. Unfortunately, due to increasing government and media skepticism and interference, all 174 level six or above superheroes aren’t interested in taking part so Prock and friends must resort to recruiting from the reject file. Previous rejects include Zip ‘Frantic’ Danger (Taran Killam), the world’s third fastest man; Austin ‘Impresario’ Sullivan (Kenan Thompson), who can conjure up anything; and Sumo (Bobby Lee), an 11 year old with level nine powers. Original Awesomes member Gadget Gal (Paula Pell) is persuaded to rejoin after a rejuvenation ray makes her 25 again. And finally, there’s Katherine ‘Hotwire’ Malocchio (Rashida Jones) who can manipulate electricity. However, she’s the daughter of evil genius Doctor Malocchio (Bill Hader) so some members of the team are naturally suspicious of her motives. When Mr. Awesome gets hold of the only thing in the world that can kill him, The Awesomes must get creative to stop him. Meanwhile, Perfect Man discovers a secret from his past. Fred Armisen, Vanessa Bayer, Will Forte, and Leslie Jones are guest stars. First aired: November 3, 2015. What do you think? Do you like The Awesomes TV show? Do you think it should have been cancelled or renewed for a fourth season? I think it was as it’s name states. New spin for a heart theam I and a lot of others thought it was going to last, I think they made a mistake taking it off the rosters. Hulu pulled a Fox futurama move and messed up. I hope someone picks the awesomeness up again like robot chicken, and super mansion, the awesomes is a great comedy to behold! I only started watching a few days ago, but I’ve fallen in love with the show. Please Hulu, bring it back! this was a GREAT show! shame on Hulu for cancelling it right when the plot twists started happening! I wish they will bring it back for a season 4 at least for a proper send off! BRING IT BACK!! Just finished watching The Awesomes, and it’s very disappointing that there’s no conclusion. It would be awesome if Hulu could bring the show back for at least one more season to give it a proper ending! Bring back The Awesomes!!! I cancelled my Hulu subscription and I’m never going back. Waste of money, none of their original series are as good as the original series on Netflix, shows like this at least made them entertaining. I got absolutely hooked on The Awesomes. Please! Someone reboot it!!!! My fiancé got me hooked on The Awesomes!!!! Please renew it, I would love a season 4!!!! 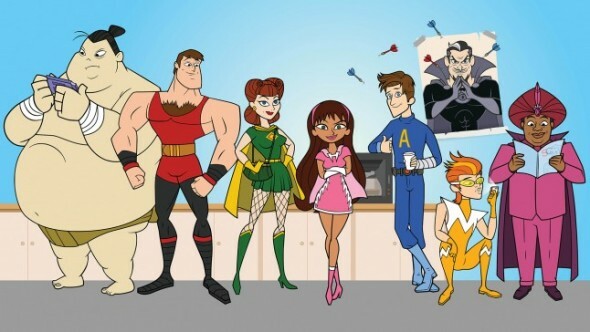 I loved the Awesomes, I really wish it would’ve been renewed for a 4th season. The plot twist of Mr. Awesomes “other son” (don’t wanna spoil it for those who havent watched it yet) kinda saw coming but would’ve made for great watching. Really hope some how it gets rebooted.